Q. What is the best method of getting started in waterfowl? A. That depends upon your means and upon your purposes for the birds. The least expensive (and most risky) way to get started is to purchase hatching eggs. The risk is great because usually, beginners are not adept at hatching and because eggs can be damaged in shipment but not cracked so one will not be able to tell until the eggs are candled and there is apparently no fertility. One can quite possibly have little or nothing to show from a batch of shipped hatching eggs. The second way to get started is to purchase day old ducklings or goslings. There are two types of distributors of day olds, the commercial and the small supplier of show quality stock. The commercial hatchery supplies day olds in quantity for meat, the production of eggs, or for use as weeders to orchards and large growers. Birds obtained in this manner will not usually be suitable for exhibition purposes. If one is buying stock to be shown at fairs or poultry shows, one should seek out a breeder to buy from. Such people are usually small operators who sell their surplus. Some sell eggs or day olds but the majority do not. In the bantam ducks, very few breeders will sell the eggs or ducklings of superior stock. The third way to get started is to purchase grown stock in the fall of the year. The is likely to involve the most initial cost but is also the most reliable way to get a good start. Q. Why should I purchase the birds in the fall? Why not in the spring? A. In the fall, the supply of good quality stock is usually at the highest it will be all year, therefore the prices are usually the best, quality considered. Thats because breeders are selling off surplus young birds and also disposing of breeding stock which they are replacing in their flocks. It is a simple matter of buying when the law of supply and demand favors the buyer. In the spring, a breeder has fed and cared for the birds all winter, has borne the risk of loss of the birds, and is just about to reap the rewards by hatching the young; why would he want to sell those birds just as the breeding season is about to begin? Usually, there are only two reasons to do so: either the birds are of marginal quality and so nothing really valuable is likely to come from them or he is selling the birds at a high price which will compensate him for the loss of duckling production. Q. How does someone who wishes to purchase good stock in a given breed go about locating a breeder? A. The Poultry Press (see article on sources of information) is an invaluable source of help in locating good stock. It contains hundreds of classified ads in which breeders offer stock for sale. It also contains show reports and coverage of major shows which highlight who is winning regularly. One can easily track who is doing well consistently from such information There are also pictures of winning birds and articles by leading breeders. Last but not least, one can learn of upcoming shows in one's area and attend those shows in person. Personally attending shows and talking with the exhibitors is a great source of information and education. Q. What about the cost of exhibition quality stock? A. In the large (non-bantam) ducks and in most geese, good breeding/show birds may generally be obtained in the $30-50 per bird range. That is for sound stock with no major defects which should produce good quality offspring. Bantam ducks of good quality are usually more expensive because they are much more difficult to produce in numbers. Expect to pay $75- $100 per bird for good quality stock. Toulouse geese may be the most difficult of all the breeds of waterfowl to get good hatches from on a consistent basis. As a result, prices for good birds usually start at $250 and go up. The Toulouse is not a beginner's bird. As you can see, price is generally correlated to the difficulty involved in producing high quality offspring. Q. What if I want to buy stock from a breeder in another part of the country? Is it possible to ship grown birds? A. Yes, birds of almost all breeds can be shipped by Express Mail through the Post Office. Specially designed boxes must be used. The larger and heavier a bird is, the more it costs, of course. I generally charge a flat rate of $65 per order to ship up to 4-5 of my bantam ducks and chickens. That includes the reusable box as well as shipping costs. 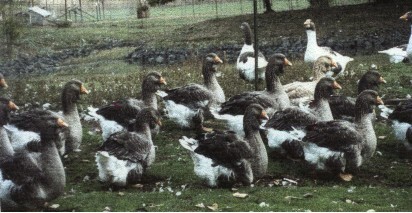 Shipping geese or large ducks, however can cost more like $60 per bird or even more. Under most circumstances, the birds arrive the next day although some shipments take two days. There is usually no injury or loss involved. some breeders are willing to ship and others are not. If you can't go get the birds, be sure that shipping is possible before you place the order and verify what the shipping will cost.